I am delighted that the Pegasus Books edition of The Memory Code is now available for pre-order from Amazon.com. Pegasus is publishing for North America (US and Canada) while Atlantic Books are publishing for the UK and Europe. Both are using the same cover and publishing initially in hardback. This is so exciting! These editions follow the Australian edition from Allen & Unwin. Using traditional Aboriginal Australian songlines as a starting point, Dr. Lynne Kelly has since identified the powerful memory technique used by our ancestors and indigenous people around the world. In turn, she has then discovered that this ancient memory technique is the secret purpose behind the great prehistoric monuments like Stonehenge, which have puzzled archaeologists for so long. 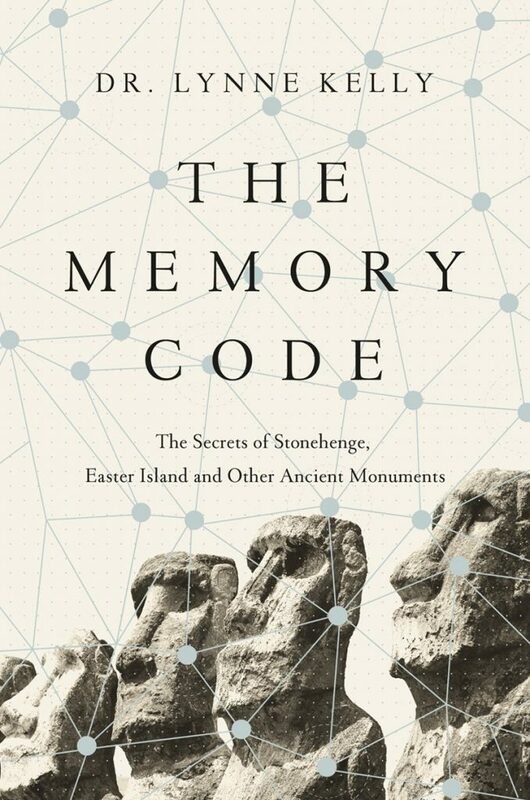 The henges across northern Europe, the elaborate stone houses of New Mexico, huge animal shapes in Peru, the statues of Easter Island―these all serve as the most effective memory system ever invented by humans. They allowed people in non-literate cultures to memorize the vast amounts of information they needed to survive. But how? For the first time, Dr. Kelly unlocks the secret of these monuments and their uses as “memory places” in her fascinating book. Additionally, The Memory Code also explains how we can use this ancient mnemonic technique to train our minds in the tradition of our forbearers. This entry was posted in archaeology, Easter Island, indigenous memory systems, memory, memory devices, memory places, Memory Spaces, mnemonics, Nasca lines, Neolithic, prehistory, primary orality, songlines, stone circles, Stonehenge, The Memory Code and tagged archaeology, Easter Island, memory, memory places, mnemonic devices, mnemonics, Nasca lines, Neolithic, primary orality, Stonehenge, The Memory Code. Bookmark the permalink. There are very few books that truly have changed my perception of the world; The Memory Code is certainly one of these. After savouring and assimilating every page I now see evidence of your hypothesis in many places. Some examples follow: the unworked standing stones described in the Tanak (Hebrew Bible); the knotted tassels on the corners of the Jewish prayer shawl; the Cairns described in Tim Cope’s book On the Trail of Genghis Kahn which follows his travels from Mongolia to the Danube River in Hungary; and more. Thank you for opening the eyes of my understanding. Thank you so much for such a lovely comment and so many interesting ideas to pursue. I am finding that the ideas in The Memory Code resonate with so many people and so many different aspects that it is incredibly rewarding to receive messages such as this. I really appreciate you taking the time to write.